To find out exactly which pieces of information you will need (and which ones you are required to have in order for this to work), take a look at the Google Developers Remarketing resource article. This parameter indicates the type of page that the tag is on. The value for page type can be (home, searchresults, category, product, cart, purchase). To insert these values in the parameters, we need first to capture the page type then return the relevant value for each path. In the case of you not have a unique identifier to determine the page type through the URL structure, this method is not going to work for you, please have a look at the next one. This is the product ID of the product or products displayed on the current page – the IDs used here should match the IDs in your GMC feed. This parameter should be passed when the ecomm_pagetype is product or cart. On the product page, you will generally have a single product and so a simple single literal value can be passed; on cart page, if there is more than one product shown (i.e. 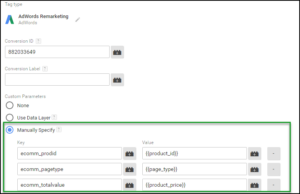 if the user has more than one product in their cart) then an array of values can be passed.